Tanna of the first and second centuries; witness, and perhaps victim, of the Roman persecutions, when, of thousands of scholars at Bethar, only his younger brother Simon b. Gamaliel II. is said to have escaped (Yer. Ta'an. iv. 69a; comp. Lam. R. ii. 2). 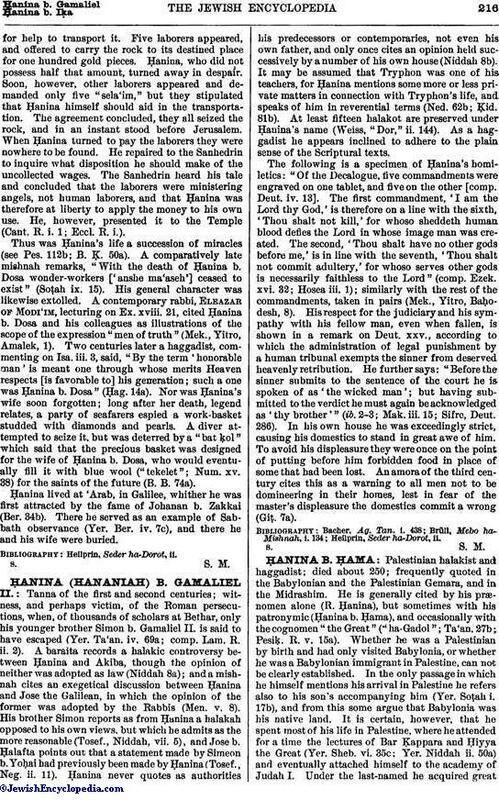 A baraita records a halakic controversy between Ḥanina and Akiba, though the opinion of neither was adopted as law (Niddah 8a); and a mishnah cites an exegetical discussion between Ḥanina and Jose the Galilean, in which the opinion of the former was adopted by the Rabbis (Men. v. 8). His brother Simon reports as from Ḥanina a halakah opposed to his own views, but which he admits as the more reasonable (Tosef., Niddah, vii. 5), and Jose b. Ḥalafta points out that a statement made by Simeon b. Yoḥai had previously been made by Ḥanina (Tosef., Neg. ii. 11). Ḥanina never quotes as authorities his predecessors or contemporaries, not even his own father, and only once cites an opinion held successively by a number of his own house (Niddah 8b). It may be assumed that Tryphon was one of his teachers, for Ḥanina mentions some more or less private matters in connection with Tryphon's life, and speaks of him in reverential terms (Ned. 62b; Ḳid. 81b). At least fifteen halakot are preserved under Ḥanina's name (Weiss, "Dor," ii. 144). As a haggadist he appears inclined to adhere to the plain sense of the Scriptural texts. The following is a specimen of Ḥanina's homiletics: "Of the Decalogue, five commandments were engraved on one tablet, and five on the other [comp. Deut. iv. 13]. The first commandment, 'I am the Lord thy God,' is therefore on a line with the sixth, 'Thou shalt not kill,' for whoso sheddeth human blood defies the Lord in whose image man was created. The second, 'Thou shalt have no other gods before me,' is in line with the seventh, 'Thou shalt not commit adultery,' for whoso serves other gods is necessarily faithless to the Lord" (comp. Ezek. xvi. 32; Hosea iii. 1); similarly with the rest of the commandments, taken in pairs (Mek., Yitro, Baḥodesh, 8). His respect for the judiciary and his sympathy with his fellow man, even when fallen, is shown in a remark on Deut. xxv., according to which the administration of legal punishment by a human tribunal exempts the sinner from deserved heavenly retribution. He further says: "Before the sinner submits to the sentence of the court he is spoken of as 'the wicked man'; but having submitted to the verdict he must again be acknowledged, as 'thy brother'" (ib. 2-3; Mak. iii. 15; Sifre, Deut. 286). In his own house he was exceedingly strict, causing his domestics to stand in great awe of him. To avoid his displeasure they were once on the point of putting before him forbidden food in place of some that had been lost. An amora of the third century cites this as a warning to all men not to be domineering in their homes, lest in fear of the master's displeasure the domestics commit a wrong (Giṭ. 7a).